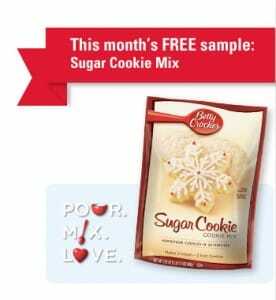 If you’ve been a Betty Crocker email subscriber as of 10/16, click here to visit their site click login on the top right, and you’ll be able to request free Betty Crocker Sugar Cookie Mix. Just fill out the form on the next page. Allow 6-8 weeks for delivery. If you aren’t a member, no worries. Just sign up today and you’ll be eligible for future free samples from them. site says: Thanks for your interest, but the entry period for this promotion has ended. Please come back soon!